Doctors have recognized that in order for the brain to function properly and for the neurotransmitters in the brain to receive messages, the hypothalamus must be working correctly, since it is the functioning center for four of the brains most powerful hormones (neurotransmitters) that affect the mind; Serotonin, Dopamine. Norepinephrine and Acetylcholine. The main function of the hypothalamus is homeostasis, or maintaining the body's status quo. Factors such as blood pressure, body temperature, fluid and electrolyte balance. and body weight are held to a precise value called the set-point. Although this set-point can migrate over time, from day to day it is remarkably fixed. What does the Hypothalamus really do? The hypothalamus is located immediately below the thalamus at the center of the brain, and controls many automatic functions of the body. This means it has the power to govern the autonomic (automatic or subconscious) nervous system. 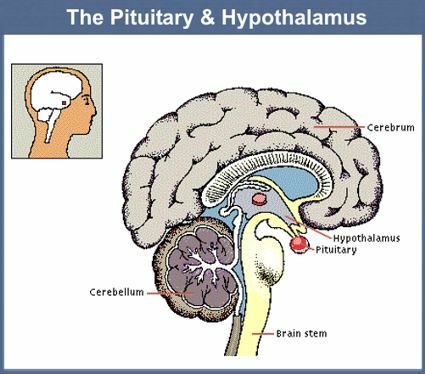 The hypothalamus also controls pituitary output by secreting specific chemicals to the pituitary's front lobe. Very simply, the Hypothalamus organizes and controls many complex emotions, feelings and moods. as well as all motivational states including hunger. appetite and food intake, and everything to do with the concept of pleasure including satisfaction, comfort and creative activities. The neurons in the Hypothalamus produce a number of Hypothalamic neurotransmitters which relay information and instruction to all parts of tile brain and body, directly influencing the Pituitary Gland. where Growth Hormone, Thyroid Hormone Releasing Factor and other neuro peptides are released via Hypothalamic input. The Hypothalamus (with the Cerebral Hemispheres) is intimately involved in the integration of all physiological stimulation. All 5 senses, including taste, smell. sight. sound, and touch. which It then translates, distills and assembles Into one discernible "package," relating all the attributes of an experience, all the associated stimulation into one clear harmonious concept, one memory. one experience. Thus, yielding a succinct emotionally satisfying understanding and judgment of the experience itself. What happens when the Hypothalamus Doesn't work Properly? When the Hypothalamus is not working correctly, when it's not functioning up to par, the wrong neuro-signals are generated and the wrong neuro-messages are received, resulting in an inaccurate integration of all our sensory input. leading to faulty perceptions which are very subtle but nonetheless powerful, making us feel empty, deprived and emotionally "unsatisfied." Dysfunction of the hypothalamus often leads to depression, hyperactivity, abnormal responses to stress, or disturbances in brain and limbic functioning. The function of these vital systems can be altered by various causes ranging from food mishandling, dependency & substance withdrawal, stress or psychological responses to simple functional deficits, hyperactivity, hypo activity or learning disabilities. Unfortunately, Hypothalamic function becomes impaired with age, so as we grow older the Hypothalamus needs support to maintain optimum performance. It appears that almost everything the Hypothalamus does is related in some way to weight management and controlled weight loss. Most simply, when the Hypothalamus is "broken," food becomes increasingly more important, but increasingly more unfulfilling. We end up never feeling satisfied with the foods which we have eaten, gradually eating more and more to try to compensate for whatever is lacking! From a metabolism stand point, the Hypothalamus not only governs the motivation to eat, stimulating hunger and appetite, but most importantly how eating is to be experienced and reflected upon, whether it is satisfying or not, and how deep the satisfaction occurs. This gives us an idea as to just how important healthy Hypothalamic function really is! The first 20 days using the Second chance hormone, reprograms the hypothalamus. It takes this long for the effects on the hypothalamus to occur so your dedication to the program is critical during this time. The most positive results will be obtained If you stay on the diet without adding anything for the first 20 days. After 20 days... If you go off the diet for a day or even a meal, there will be a set-back in weight loss by about 3 days and you will experience increased hunger, but it will not undo the progress that has been made to that point. However, during the first 20 days, the reprogramming in the hypothalamus is taking place. A disruption during this time will affect long-term weight loss. After 20 days, the occasional lapse in diet will not affect the hypothalamus. The patient can continue as long as needed until weight loss goals achieved. Hypothalamus Function Home BLOG --BLOG SPOT Personal Training --About Us --Our Mission 1-10 --Our Guarantee --General tips ---Keep the Carbs in your diet ---Home workouts made easy ---Do you have problems losing pounds of fat vs muscle? ---Time for heavy workouts ---Effective dumbbell exercises ---5 Fitness Steps ---Change your Water... ---How to get ripped fast Lose 15-30lbs --LOSE 15-30 Lbs IN 23 DAYS! --Three Kinds of Fat --Fat on the Move --Hypothalamus Function --Commit and achieve --Now you have options. --COUPONS Services --Teeth Whitening --Body Blueprint Analysis --Fitness Center LA ---Teeth Whitening Los Angeles ---Weight loss Centres Los Angeles ---weight control programs ---Spa clubs LA ---Weight loss programs ---Weight loss clubs LA --BOOTY CAMP --Body Type Test --Beach Body Boot Camp Contact us FAQ --FAQs on Personal Training --FAQs on Weight Loss Testimonials BookNow!